THE STORY - Based on the graphic novels by Mike Mignola, Hellboy, caught between the worlds of the supernatural and human, battles an ancient sorceress bent on revenge. THE GOOD - Dark production design and makeup effects. THE BAD - Horrible editing, soundtrack choices, dialogue, acting, visual effects. A complete and total mess which should stand as a warning sign for the rest of Hollywood as far as how to not reboot franchises in the future. ​​​​​If you ever wanted to know what cinematic hell looks like in 2019, the answer is probably the reboot of "Hellboy." A complete disaster from beginning to end in all areas of production, much has been publicized about the behind the scenes troubles that this film has had to endure. Now, finally released in theaters for us all to witness, we are the ones who have to endure what these filmmakers have wrought. In what is undoubtedly one of the worst films of 2019, "Hellboy" has obtained the gold standard of being that film everyone in Hollywood thinks we want but the reality is that we want something of quality...not whatever this is. Hellboy (David Harbour) is a strong, red Cambion who works for the government organization Bureau for Paranormal Research and Defense (B.P.R.D.) which specializes in paranormal investigations. Taken in at birth, instead of killed by Trevor Bruttenholm (Ian McShane), Hellboy has lived a divided life not knowing if he's human or much like the demons the organization he works for is always hunting. He gets caught up in the attempted resurrection of Nimue, otherwise known as "the Blood Queen" (Milla Jovovich), who if successfully brought back to life from the time's of Arthur, Excalibur, Merlin and all of that (Yeah...), will bring about the end of the world and everything Hellboy holds dear including his relationship with his surrogate father, a powerful medium (Sasha Lane), and a new friend in Ben Daimio (Daniel Dae Kim), a member of B.P.R.D. who can turn into a giant jaguar. It's very hard to put into words just how atrocious "Hellboy" is without sounding redundant. The script features the one-liners and zingers we expect to hear from the giant red demon but they're undercut by choppy editing that disrupts the flow of entire scenes and does not allow for the jokes to land properly. The film is also very heavy on exposition and unless you walk in with a little bit of familiarity with who the character is, newcomers will truly be lost in the film's mythos and reason for existence. Nearly every visual effects shot looks horribly rendered, either lacking in detail or not immersive enough to be believed. There is some decent art direction and makeup work done here and there but those moments are negligible compared to the other crimes this film commits. There are lazy soundtrack choices, across the board unmemorable acting choices, gratuitous over-the-top violence that looks like it belongs in a teenage boy's videogame and did I happen to mention the pointless scene involving Thomas Hayden Church as a Nazi Hunter who brands his enemies with his hand? Yeah, this movie is crazy and not in a good way. 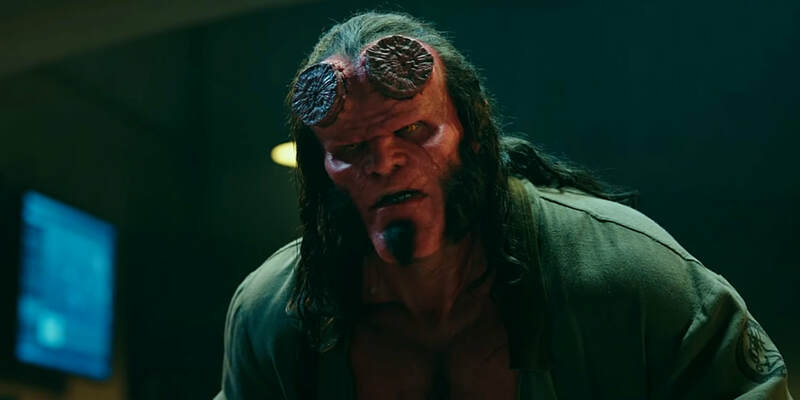 David Harbour (God or Satan bless him), does his best to give Hellboy some personality and emotes more through the makeup than I imagined he would. However, even with his charm, there is no salvation for the big red guy as he always seems to be at odds with the tone that the film takes. It doesn't know if it wants to be a "Deadpool" type of snarky, ultra-violent comic book film or if it wants to be an imaginative fantasy-based action epic steeped in drama and seriousness. As I said before, I know the blame does not fully belong to director Neil Marshall, who we know can deliver exciting pieces of cinema (and television too on "Game Of Thrones") but there's no denying that "Hellboy" is the ultimate crash and burn reboot for Hollywood since Josh Trank's failed 2015 "Fantastic Four" reboot. Giants, demons, Nazi's, blood queens, severed limbs, buckets of blood, distorted bodies, lucha libre, large jaguars and hogs and let's also throw the legend of King Arthur in there somewhere. Wow, is this movie a complete mess or what? This version of "Hellboy" will only be able to justify its existence if it serves as a warning to future filmmakers, producers, and screenwriters on how to not reboot a franchise. There are many reasons why things went so horribly wrong here and not everything can be laid at the feet of Neil Marshall, who by all accounts did not have the singular creative input he should've to bring this beloved character to a new generation. You can see that conceptually speaking, there was a blueprint and a good idea on how to reboot "Hellboy" but for now and always, we should just stick with the Guillermo del Toro originals.